Pension is taxable under the head salaries in your Income Tax Return. Usually, pension is paid out periodically, on a monthly basis, However, you may also choose to take pension as a lump sum (also called commuted pension) instead of a periodical payment. Let’s first understand commuted pension by way of an example. At the time of retirement, you may choose to receive a certain percentage of your pension in advance. Such pension received in advance is called commuted pension. For e.g. – At the age of 60, you decide to receive 10% of your monthly pension in advance of the next 10 years of Rs 10,000. This will be paid to you as a lump sum. Therefore, 10% of Rs 1000x12x10 = Rs 1,20,000 is your commuted pension. You will continue to receive Rs 9,000 (your un-commuted pension) for the next 10 years until you are 70 and post 70 years of age, you will be paid your full pension of Rs 10,000. Uncommuted pension or any periodical payment of pension is fully taxable as salary. In the above case Rs, 9,000 received by you is fully taxable. Rs 10,000 starting at the age of 70 yrs are fully taxable as well. Commuted pension or lump sum received may be exempt in certain cases. For a government employee, commuted pension is fully exempt. For a non-government employee, it is partially exempt. If Gratuity is also received with pension – 1/3rd of the amount of pension that would have been received if 100% of the pension was commuted, is exempt from commuted pension and remaining is taxed as salary. And in case only pension is received, gratuity is not received – ½ of the amount of pension that would have been received if 100% of the pension was commuted is exempt. Pension received by a family member is taxed under income from other sources in your Income Tax Return. If this pension is commuted or is a lump sum payment it is not taxable. Uncommuted pension received by a family member is exempt to a certain extent. 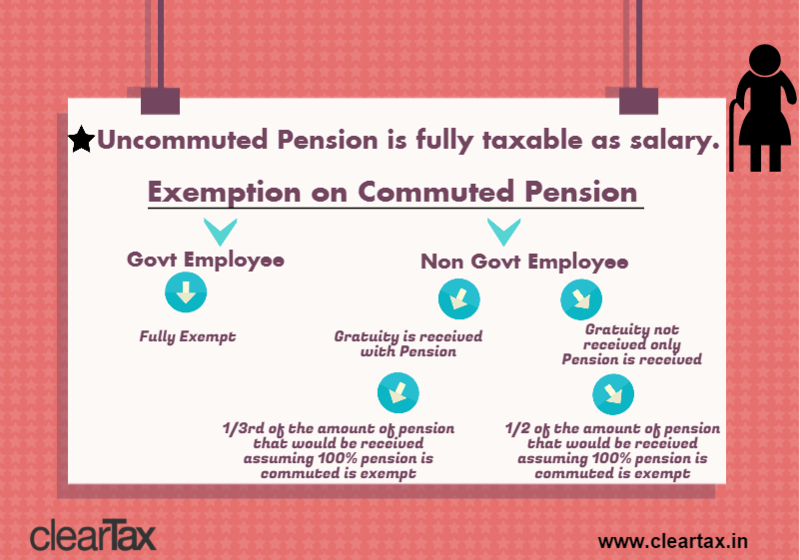 Rs 15,000 or 1/3rd of the uncommuted pension received -whichever is less is exempt from tax. Pensions that is received from UNO by its employees or their family is exempt from tax. Pension received by family members of Armed Forces is also exempt. If you have any questions related to tax on pension, reach out to us support@cleartax.in and we will assist you.